The exposure of An. arabiensis to insecticides could occur at the larval stage where they come in contact with freshly sprayed or persistent molecules in the breeding sites and at the adult stage through contact with pesticides used in agriculture or during veterinary, medical, or domestic use. , Therefore, this study aimed at utilizing longitudinal monitoring of kdr and rdl alleles due to a reported reduction in An. gambiae sensu lato susceptibility to permethrin and other pyrethroids , and a low kdr frequency in a cross-sectional study in this study area. Due to cyclodiene residues being found in soil and water within the lower Moshi area, the dieldrin (rdl) locus of the GABA receptor, the main target for cyclodiene compounds, was genotyped. The study site was located in lower Moshi in the Kilimanjaro region of the northern Tanzania in an area utilizing a rice irrigation scheme (3°21′S, 37°21′E). A more detailed description of the study area can be found elsewhere. Meteorological data were obtained from the Kilimanjaro International Airport Meteorological Station. Mosquito sporozoite detection utilized the enzyme-linked immunosorbent assay (ELISA) using the protocol of Wirtz et al. The annual entomological inoculation rate (EIR) was calculated by using the formula published in a previous work  for light trap collections: 1.605 × (number of sporozoite-positive mosquitoes detected by ELISA/number of mosquitoes tested) × (number of mosquitoes collected/number of collections performed) × 365. DNA was extracted from legs of 535 individual mosquitoes by using DNA Easy Kit (Qiagen, Valencia, CA, USA) according to the manufacturer protocol for insects. DNA was eluted in a 200 μl volume. The polymerase chain reaction (PCR) protocol was used to perform the amplification of DNA for species identification and other molecular use. Five microliters of DNA extract were amplified in a 25 μl PCR mix containing 1× Taq buffer (Qiagen, Valencia, CA, USA), 2 mM of MgCl 2 , 0.2 mM of each dNTP, 0.5 ng/μl of primer UN [5-GTG TGC CCC TTC CTC GAT GT-3′], 0.25 ng/μl of primer GA [5′-CTGGTTTGGTCGGCACGTTT-3′], 0.73 ng/μl of primer AR [5′-AAGTGTCCTTCTCCATCCTA-3′], 1 ng/μl primer QD [5′-CAGACCAAGATGGTTAGTAT-3′], 0.5ng/μl primer ME [5′-TGACCAACCCACTCCCTTGA-3′], and 0.05 U/μl HotstartTaq polymerase (Qiagen, Valencia, CA, USA). The PCR was carried out with an initial step of 10 min at 94°C to activate the DNA polymerase followed by 30 cycles, each consisting of 5 min denaturation at 94°C, 30 s annealing at 50°C, and 30 s extension at 72°C; the final cycle products were extended for 10 min at 72°C. Fragments were run through an ethidium bromide 2% agarose gel and photographed under ultraviolet light illumination. This procedure was based on a developed PCR protocol for the detection of the kdr mutation (L1014S) in East African An. gambiae complex mosquitoes. Five microliters of DNA extract were amplified in a 15 μl PCR mix containing 1× Taq buffer (Qiagen, Valencia, CA, USA), 2.5 mM of MgCl 2 , 0.2 mM of each dNTP, 0.3 ng/μl of primer Agd1 [5′-ATAGATTCCCCGACCATG-3′] and Agd2 [5'-AGACAAGGATGATGAACC-3'], 0.5 ng/μl of primer Agd4 [5′-CTGTAGTGATAGGAAATTTA-3′] and Agd5 [5′-TTTGCATTACTTACGACTG-3′], and 0.05 U/μl HotstartTaq polymerase (Qiagen, Valencia, CA, USA). PCR was carried out with an initial step of 10 min at 95°C to activate the DNA polymerase followed by 35 cycles, each consisting of 25 s denaturation at 94°C, 20 s annealing at 55°C, and 8 s extension at 72°C. The final cycle products were extended for 10 min at 72°C. Fragments were run through an ethidium bromide 2% agarose gel and photographed under ultraviolet light illumination. A total of 535 mosquitoes were tested. This procedure was based on a developed PCR protocol. Five microliters of DNA extract were amplified in a 25 μl PCR mix containing 1× Taq buffer (Qiagen, Valencia, CA, USA), 1.5 mM of MgCl 2 , 0.2 mM of each dNTP, 0.04 ng/μl of primer RdlF [5′-AGTTTGTACGTTCGATGGGTTA-3′], RdlR [5′-CCAGCAGACTGGCAAATACC-3], AARdl [5′-GCTACACCAGCACGTGATT-3′] and RdlSS [5′-CAAGACAGTAGTTACACCTAAAGC-3′], and 0.05U/μl HotstartTaq polymerase (Qiagen, Valencia, CA, USA). PCR was carried out with an initial step of 10 min at 95°C to activate the DNA polymerase followed by 35 cycles, each consisting of 45 s denaturation at 94°C, 45 s annealing at 53°C, and 45 s extension at 72°C; the final cycle products were extended for 10 min at 72°C. Fragments were run through an ethidium bromide 2% agarose gel and photographed under ultraviolet light illumination. A total of 535 mosquitoes were tested. The ethical clearance was given by Kilimanjaro Christian Medical College of Tumaini University. Written consent was given to all participants whose houses were involved in this study for mosquitoes sampling by using CDC miniature light traps. A total of 6220 mosquitoes were collected that comprised the following species: 5350 (86.0%) An. gambiae s.l. and 870 (14.0%) Culex spp. Out of 5350 An. gambiae s.l. collected, 10% (n=535) was randomly sampled each month and subjected to species identification. Within that population, 99.8% (n=534) were identified by PCR to be An. arabiensis and 0.2% (n=1) was identified as An. gambiae s.s. The population of mosquitoes sampled changed from 400 mosquitoes in July 2005 to 679 mosquitoes in August 2006 [Table 1]. The study started at the end of rainy season, resulting in the low numbers of mosquitoes at the beginning of the study. The mosquito numbers subsequently increased with the start of rice-growing season and the short rains that occurred in late November 2005 and long rains that started in late February 2006. Among 535 mosquitoes identified, 19 (3.5%) of the An. arabiensis were found to be circumsporozoite protein positive. This resulted in an annual EIR of 0.54 ib/trap/year. Mutation points were detected in 477 of the 534 An. arabiensis, which were successfully genotyped for kdr 1014S and rdl based on diagnostic PCR results. No samples tested positive for the knockdown resistance mutation L1014S of the sodium channel gene. However, the rdl locus mutation was found with a resistant allele frequency of 0.48 throughout the 14 months of study. In monthly assessments, the resistant allele frequencies dropped from 0.73 and 0.70 in July and August 2005, respectively, to 0.31 and 0.32 for the same period in 2006. During this 14-month period, heterozygote proportions (standard deviation) were 33.13% (19.9) for RR (homozygote resistant), 28.88% (18.15) for SS (homozygote susceptible), and 37.99% (10.37) for RS (heterozygote resistant). However, throughout the year, the rdl genotype proportions fluctuated. The proportion of homozygote-resistant genotype (RR) decreased from 57 and 48% in July and August 2005, respectively, to 15 and 12% during the same period in 2006. In contrast, homozygote-susceptible genotypes (SS) increased from 11 and 7% in July and August 2005 to 51 and 47% the following year. Heterozygote proportions (RS) showed a stable pattern varying from 31 and 45% to 34 and 40% between July/August 2005 and July/August 2006 [Figure 1]. No direct relationships were observed between these genotype fluctuations and climatic factors or insecticide use in rice fields. Among the 19 specimens found positive for Plasmodium falciparum circumsporozoite protein, 7 were RR, 4 were RS, and 8 were SS. In parallel evaluations, permethrin susceptibility among wild population of the An. 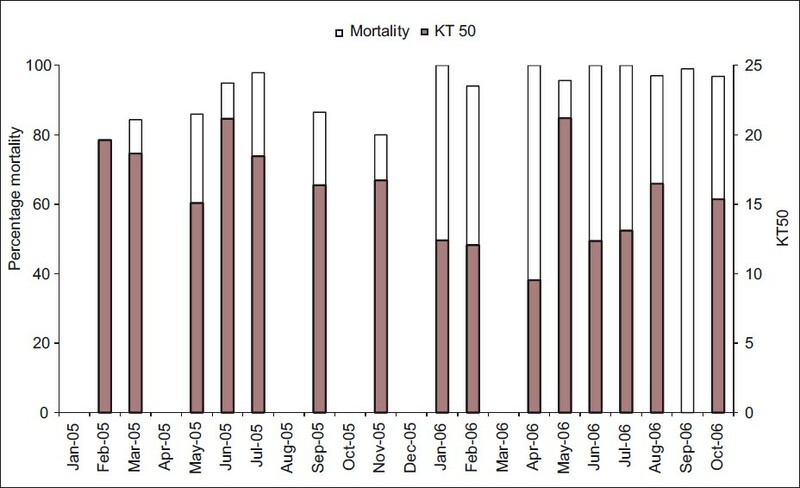 arabiensis in this study area was monitored from January 2005 to August 2006 and seemed to have seasonal variation in mosquitoes' mortality and knockdown percentage [Figure 2]. Although previous studies reported only An. arabiensis, in this rice-growing region of lower Moshi, Tanzania, this report demonstrates that An. arabiensis and An. gambiae s.s. are both present in this region. This is the first observation that An. gambiae s.s. is also present in lower Moshi. It was not observed in previous studies, but arguably it might be due to climate change and land-use practice changes. In this same study site, metabolic resistance is known to be a major reason for reduced permethrin susceptibility among adult mosquitoes. 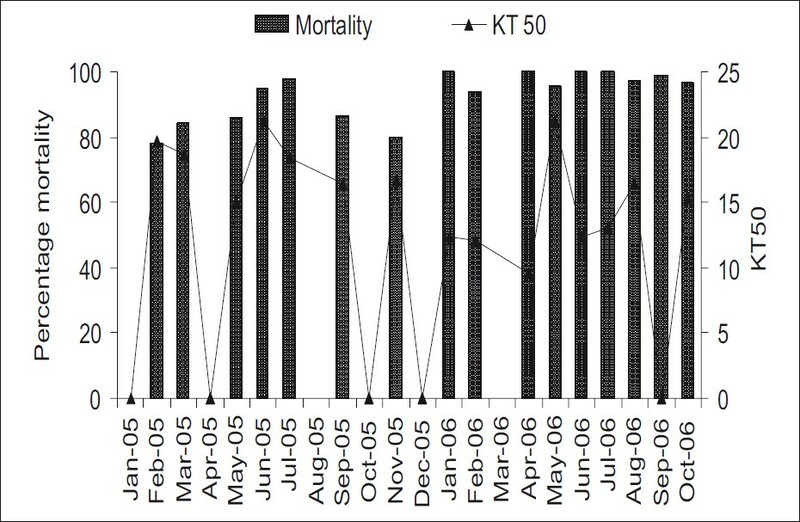 Variation of permethrin tolerance done in previous years [Figure 2] were shown to deviate within months of the years. Insecticides used for agricultural activities may have contributed to this resistance since our results show a significant increase in the mutated rdl allele along with yearly variations in the An. arabiensis population. This mutation is known to confer resistance to dieldrin, endosulfan, and lindane, all of which are used in agriculture and are found in water, sediment, and soil in the Moshi area. In western Africa, a strong association was found between insecticide resistance in mosquitoes and the use of agricultural pesticides. The resistant allele frequency at the rdl locus was found to decrease during the 14 months of the collection along with the genotype RR and an increase in genotype SS proportions. These findings suggest that the use of agricultural insecticides should be taken in consideration by public health disease vector control officials since pesticide residues in the soil contributes to the spread of resistance among disease vectors. The variations in rdl homozygote and heterozygote alleles have imparted a tolerance for dieldrin among mosquitoes in the rice-growing region in lower Moshi. The Abuja declaration aims to cover 60% of the population living in malaria endemic areas of Africa with insecticide-treated bed nets by the end of 2010. The absence of both West and East African kdr resistances in lower Moshi allows for longer performance time for pyrethroid-treated bed nets (conventionally made and/or industrially treated) and long-lasting insecticide-treated nets (LLITNs) to continue their ability to kill mosquitoes. ITNs and LLITNs show efficacy in most areas of Tanzania and other parts of Africa. The active surveillance of the L1014P kdr mutation should be maintained in the years to come as part of the vector control program in lower Moshi and in similar agro-ecosystems. An. arabiensis is both zoophilic and exophilic in our study area. The implementation of an active zoophylaxis is necessary as a complementary part of vector control to lower the EIR. It is therefore a viable vector control method to attract mosquitoes away from human dwellings to animals, resulting in an EIR lower than 0.54 ib/person/trap/year observed during the study. The findings of this study suggests that agricultural, veterinary, and public health workers need to minimize pesticide residues waste in soil to prevent contaminations of the mosquito larval habitats and subsequently the evolution of resistance in malaria vectors against pesticides used for public health that have similar ingredients to those used in agriculture and veterinary services. The authors wish to thank the villagers of lower Moshi who are residents in irrigation schemes for allowing mosquito sampling to be conducted in their homes. Belgium Technical Cooperation (BTC) in Tanzania is gratefully acknowledged for providing funds for the field activities. The vector control project at Kilimanjaro Christian Medical Centre is highly acknowledged for transport assistance. The authors wish to thank Mr. Charles Massenga and Mr. Augustine Mtui for their active participation in the collection and field identification of mosquitoes. 1. Hemingway J, Field L, Vontas J. An overview of insecticide resistance. Science 2002; 298:96-7. 2. Akogbéto M, Yakoubou S. Resistance of malaria vectors to pyrethrins used for impregnating mosquito nets in Benin, West Africa. Bull Soc Pathol Exot. 1999;92:123-30. 3. Diabate A, Baldet T, Chandre F, Guiguemde RT, Brengues C, Guillet P, et al. First report of the kdr mutation in Anopheles gambiae M form from Burkina Faso, west Africa. Parassitologia 2002; 44:157-8. 4. Jan MR, Shah J, Khawaja MA, Gul K. DDT residue in soil and water in and around abandoned DDT manufacturing factory. Environ Monit Assess 2009; 155:31-8. 5. Mandocdoc M, David CP. Dieldrin contamination of the groundwater in a former US military base (Clark Air Base, Philippines). Clean Soil Air Water 2008; 36:870-4. 6. Akogbeto MC, Djouaka R, Noukpo H. Use of agricultural insecticides in Benin. Bull Soc Pathol Exot 2005; 98:400-5. 7. Chouaibou M, Etang J, Brevault T, Nwane P, Hinzoumbe CK, Mimpfoundi R, et al. Dynamics of insecticide resistance in the malaria vector Anopheles gambiae s.l. from an area of extensive cotton cultivation in Northern Cameroon. Trop Med Int Health 2008; 13:476-86. 8. Dusfour I, Achee NL, Briceno I, King R, Grieco JP. Comparative data on the insecticide resistance of Anopheles albimanus in relation to agricultural practices in northern Belize, CA. J Pest Sci 2010; 83:41-6. 9. Poupardin R, Reynaud S, Strode C, Ranson H, Vontas J, David JP. Cross-induction of detoxification genes by environmental xenobiotics and insecticides in the mosquito Aedes aegypti: impact on larval tolerance to chemical insecticides. Insect Biochem Mol Biol 2008;38:540-51. 10. Mahande A, Mosha F, Mahande J, Kweka E. Feeding and resting behaviour of malaria vector, Anopheles arabiensis with reference to zooprophylaxis. Malar J 2007; 6:100. 11. Ngowi AV, Mbise TJ, Ijani AS, London L, Ajayi OC. Pesticides use by smallholder farmers in vegetable production in Northern Tanzania. Crop Prot 2007; 26:1617-24. 12. Kishimba MA, Henry L, Mwevura H, Mmochi AJ, Mihale M, Hellar H. The status of pesticide pollution in Tanzania. Talanta 2004; 64:48-53. 13. Stump AD, Atieli FK, Vulule JM, Besansky NJ. Dynamics of the pyrethroid knockdown resistance allele in western Kenyan populations of Anopheles gambiae in response to insecticide-treated bed net trials. Am J Trop Med Hyg 2004; 70:591-6. 14. Protopopoff N, Verhaeghen K, Van Bortel W, Roelants P, Marcotty T, Baza D, et al. A significant increase in kdr in Anopheles gambiae is associated with an intensive vector control intervention in Burundi highlands. Trop Med Int Health 2008; 13:1479-87. 15. Czeher C, Labbo R, Arzika I, Duchemin JB. Evidence of increasing Leu-Phe knockdown resistance mutation in Anopheles gambiae from Niger following a nationwide long-lasting insecticide-treated nets implementation. Malar J 2008; 7:189. 16. Dabire RK, Diabate A, Baldet T, Pare-Toe L, Guiguemde RT, Ouedraogo JB, et al. Personal protection of long lasting insecticide-treated nets in areas of Anopheles gambiae s.s. resistance to pyrethroids. Malar J 2006; 5:12. 17. Verhaeghen K, Bortel WV, Roelants P, Okello PE, Talisuna A, Coosemans M. Spatio-temporal patterns in kdr frequency in permethrin and DDT resistant Anopheles gambiae s.s. from Uganda. Am J Trop Med Hyg 2010; 82:566-73. 18. Mosha FW, Lyimo IN, Oxborough RM, Matowo J, Malima R, Feston E, et al. Comparative efficacies of permethrin-, deltamethrin-and alpha-cypermethrin-treated nets, against Anopheles arabiensis and Culex quinquefasciatus in northern Tanzania. Ann Trop Med Parasitol 2008; 102:367-76. 19. Kulkarni MA, Rowland M, Alifrangis M, Mosha FW, Matowo J, Malima R, et al. Occurrence of the leucine-to-phenylalanine knockdown resistance (kdr) mutation in Anopheles arabiensis populations in Tanzania, detected by a simplified high-throughput SSOP-ELISA method. Malar J 2006; 5:56. 20. Matowo J, Kulkarni MA, Mosha FW, Oxborough RM, Kitau JA, Tenu F, et al. Biochemical basis of permethrin resistance in Anopheles arabiensis from Lower Moshi, north-eastern Tanzania. Malar J 2010; 9:193. 21. Kulkarni M, FW Mosha, Rowland M, Kweka E, Temu E, Rau M, et al. Reduced permethrin susceptibility of Anopheles arabiensis from an irrigated rice growing area in northern Tanzania [In Press]. 22. Verhaeghen K, Van Bortel W, Roelants P, Backeljau T, Coosemans M. Detection of the East and West African kdr mutation in Anopheles gambiae and Anopheles arabiensis from Uganda using a new assay based on FRET/Melt Curve analysis. Malar J 2006; 5:16. 23. Kweka EJ, Mwang'onde BJ, Kimaro E, Msangi S, Massenga CP, Mahande AM. A resting box for outdoor sampling of adult Anopheles arabiensis in rice irrigation schemes of lower Moshi, northern Tanzania. Malar J 2009; 8:82. 24. WHO: Manual on practical entomology in malaria. Part II. Methods and Techniques: Division of Malaria and Other Parasitic Diseases, Geneva: 1975. 25. Gillies TM, Coetzee M. Supplement of the Anopheles of Africa South of Sahara (Afrotropical Region), vol. 55. Johannesburg Republic of South Africa Publication of The South Africa Institute of Medical Research; 1987. 26. Wirtz RA, Burkot TR, Graves PM, Andre RG. Field evaluation of enzyme-linked immunosorbent assays for Plasmodium falciparum and Plasmodium vivax sporozoites in mosquitoes (Diptera: Culicidae) from Papua New Guinea. J Med Entomol 1987; 24:433-7. 27. Lines JD, Curtis CF, Wilkes T, Njunwa T. Monitoring human biting mosquitoes in Tanzania with light traps hung beside mosquito nets. Bull Entomol Res 1991; 81:77-84. 28. Scott JA, Brogdon WG, Collins FH. Identification of single specimens of the Anopheles gambiae complex by the polymerase chain reaction. Am J Trop Med Hyg 1993; 49:520-9. 29. Ranson H, Jensen B, Wang X, Prapanthadara L, Hemingway J, Collins FH. Genetic mapping of two loci affecting DDT resistance in the malaria vector Anopheles gambiae. Insect Mol Biol 2000; 9:499-507. 30. Wilkins EE, Howell PI, Benedict MQ. IMP PCR primers detect single nucleotide polymorphisms for Anopheles gambiae species identification, Mopti and Savanna rDNA types, and resistance to dieldrin in Anopheles arabiensis. Malar J 2006; 5:125. 31. Mnzava AE, Kilama WL. Observations on the distribution of the Anopheles gambiae complex in Tanzania. Acta Trop 1986; 43:277-82. 32. Temu EA, Minjas JN, Coetzee M, Hunt RH, Shift CJ. The role of four anopheline species (Diptera: Culicidae) in malaria transmission in coastal Tanzania. Trans R Soc Trop Med Hyg 1998;92:152-8. 33. Ijumba JN, Mosha FW, Lindsay SW. Malaria transmission risk variations derived from different agricultural practices in an irrigated area of northern Tanzania. Med Vet Entomol 2002; 16:28-38. 34. Kulkarni MA, Kweka E, Nyale E, Lyatuu E, Mosha FW, Chandramohan D, et al. Entomological evaluation of malaria vectors at different altitudes in Hai district, northeastern Tanzania. J Med Entomol 2006; 43:580-8. 35. Yadouleton AW, Asidi A, Djouaka RF, Braima J, Agossou CD, Akogbeto MC. Development of vegetable farming: A cause of the emergence of insecticide resistance in populations of Anopheles gambiae in urban areas of Benin. Malar J 2009; 8:103. 36. Rugemalila JB, Wanga CL, Kilama WL. Sixth Africa Malaria Day in 2006: How far have we come after the Abuja Declaration? Malar J 2006; 5:102. 37. Malima RC, Magesa SM, Tungu PK, Mwingira V, Magogo FS, Sudi W, et al. An experimental hut evaluation of Olyset nets against anopheline mosquitoes after seven years use in Tanzanian villages. Malar J 2008; 7:38. Sun, L. and Ye, Y. and Sun, H. and Yu, J. and Zhang, L. and Sun, Y. and Zhang, D. and Ma, L. and Shen, B. and Zhu, C.